Happy Wednesday! Can you believe Thanksgiving was already one week ago?!? Crazy. I hope you have all had a fabulous day. Thank you all for the great comments today and for being so supportive of my blog and decision to try one post a day...I think it will be better to keep the food diary consolidated into a summary each night. I'll give it a trial period and see how it goes! :) I'm sorry I haven't been responding to comments...I need to play catch-up!!! My day was pretty busy, but not as busy as it really needed to be. I've got a big meeting on Tuesday in Raleigh for my project, and just 2 weeks until a big big big deadline. I'm not feeling the pressure yet which scares me...I'm afraid its going to mean some REALLY late nights at the end of this two weeks. :( I did have a fabulous run after work though! Brian and I went to UVA campus for a lovely 2 mile run. It felt SO GOOD!!! Brian's legs are much longer than mine so he gets ahead of me but is sweet enough to slow down and let me catch up. We don't talk much, which I'm actually starting to like because it gives me time to get lost in my own thoughts. I'm just so excited that running is becoming enjoyable for me again and that so far I seem to be steering clear of injury! WooHoo! I can't wait to keep increasing my mileage and run the New Year's Day 5k, it'll be here before I know it! Breakfast: Slice of Maple Banana Cornbread (still moist after 4 days!!!) 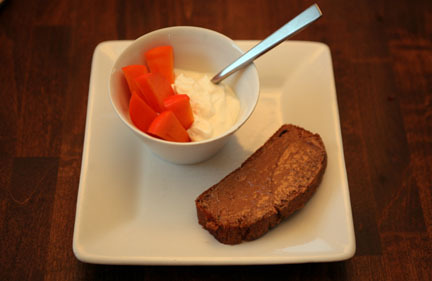 with 1 tbsp almond butter, 1 cup of vanilla Oikos and my persimmon. This was my first persimmon, and I was surprised at how sweet/mild the flavor was. I was expecting it to be much more tart. The flesh is very similar to a mango, and the skin (in my opinion) is inedible. I enjoyed it, but wound up picking it out of the yogurt to eat on its own. 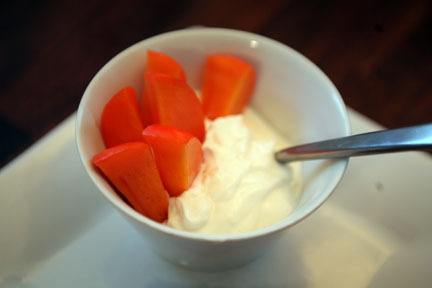 The yogurt overpowered the mild taste of the fruit. 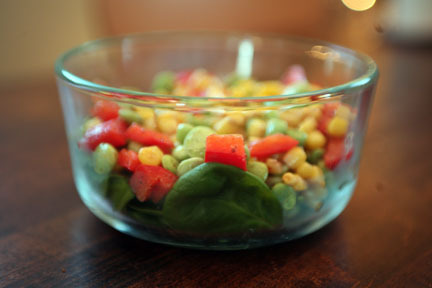 Lunch: I made a quick lima bean and corn salad (inspired from a Self recipe this summer...) and tossed it on a bed of spinach. This was such a yummy combo, the dressing from the salad coated the spinach leaves perfectly. 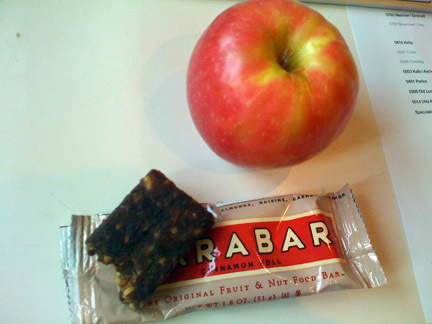 Snack: Pink Lady Apple (of course!) and the other 1/2 of my Cinnamon Roll Larabar. 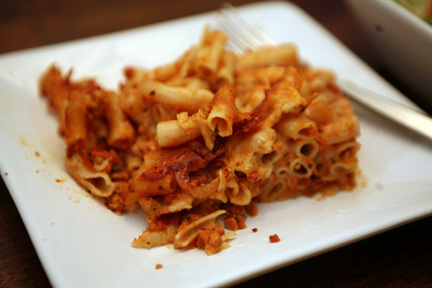 Dinner: Leftover Healthified Baked Ziti and a spinach salad. Look at that monster piece Brian cut me! Its actually only 1.5 servings, and I managed to eat most of it...! 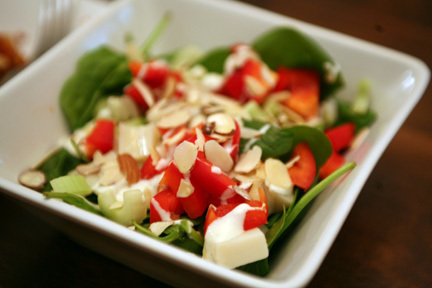 My salad tonight had fresh spinach, hearts of palm, red bell pepper, celery, almonds and light ranch dressing. Yum! Dessert: I made cookies!!! I've been in such a baking mood lately... 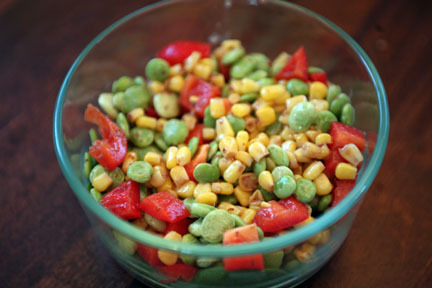 This is another of Brian's favorite recipes from his grandmother. I did make a few modifications...I just can't help myself!!! These cookies are so great and simple because they require NO BAKING!!! They are completely similar to Gina's breakfast cookies but not quite as healthy... I thought about adding banana to these but I just don't know that they would hold up well enough to actually be little bite-size cookies. Plus, I didn't want to derail Brian too much... :) Anyway, they are still hardening (but seem to be taking awhile...hopefully my modifications didn't screw them up!!!) so I will snap some pictures tonight and post the recipe tomorrow if they turn out ok. And if not, I'll post Brian's grandmothers original recipe because I KNOW they are delicious!!! 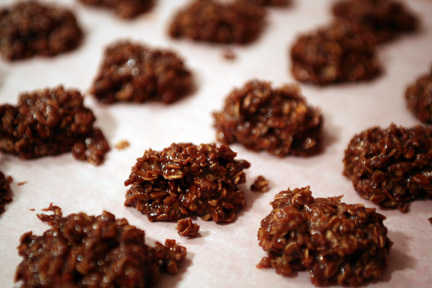 Oh little chocolate-y, peanut butter-y, oatmeal-y bites of goodness I could eat all of you!!!! 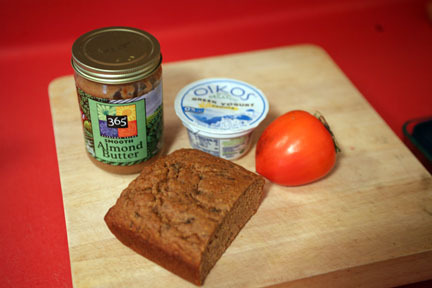 What is your favorite family recipe?